Extremely scarce German edition of Rennell's map of India. Die Halbinsel Indiens vom Kistnah Flusse bis Cap Comorin mit den Theilungen von Tippo Sahebs Landern nach den in Jahre 1782 durch Marquis Cornwallis und 1799 durch Marquis Wellesley abgeschloffenen, Tractaten, entworfenvon I. Rennell. An extremely obscure German edition of Rennell's important late 18th century mapping of India. Covers the subcontinent roughly from Hyderabad and Goa south to Comorin and Ceylon (Sri Lanka). 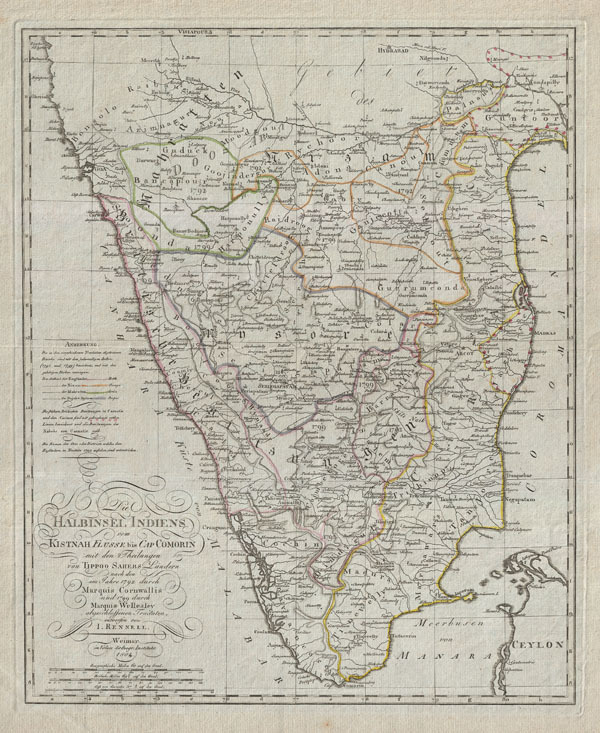 Shows the region divided into various princely states noting important forts, rivers, cities, towns, and roadways. This map is very scarce. We have been able to find no sales history on this item in the last 30 years, nor is known to be it available in any major collection. James Rennell (1742 -1830) is known as the Father of Indian Geography". Rennell was born near Chudleigh in Devon, England. At the tender age of 14 he joined the British Navy and served in the Seven Year War. Following the war he left the navy and joined the army of the British East Indian company where he was appointed surveyor of the Company's dominions in Bengal with a rank of Captain in the Bengal Engineers. Rennell was fascinated with the cartography of India and using both colonial and Indian sources composed the first accurate European maps of India. The fascinating saga of his venture can be found in Rennell's own book entitled published in 1788 and available electronically for free through Google. Rennell is also called the "Father of Oceanography" for his work charting ocean currents in the Indian and Ocean and around Africa. Rennell retired as a Major with a pension of 600 Sterling per annum.